A Tour is a list of Schedules which a train must travel. Note: A tour with multiple individual schedules waits between these individual schedules. 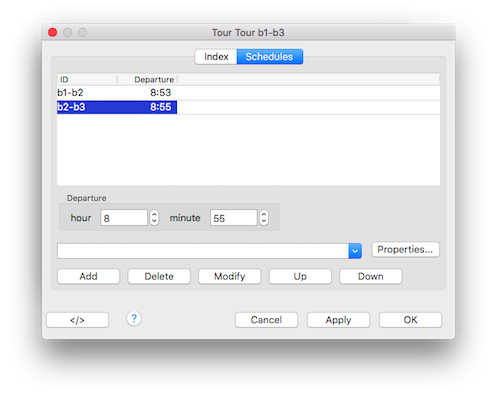 Schedules must be defined before setting up tours. List up all tours for selecting. Read only information when selecting a tour for a loco in a block; Only tours are listed which have a starting schedule which starts in this block if the "Show all" option is not set. After writing a group name in this field, or a starting part of it, it will be activated by the enter key in this field. This filter value will not be saved and is only valid for the running session. It is also used for selecting schedules for trains. Button to activate the Filter as alternative to the enter key. Recycle this tour after running the last schedule. Use absolute Depart Time in case of relative schedules. Adds a new Tour to the list. Change the name (ID) of the Tour. Deletes the Tour from the list. Copies the selected Tour and creates a new tour with the same name -suffixed by (copy). The travel sequence of the Schedules is the same as the shown in the list from top to bottom. The Departure Time of the first destination in the schedule if set to 1 minute or higher. Shows the blocks that are contained in the high-lited Schedules. The blocks can be edited. 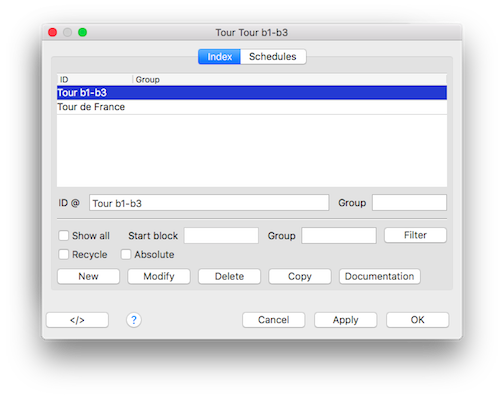 Adds the selected Schedule from the ComboBox to the Schedule/Entry list of the selected Tour. Deletes the selected Schedule from the Schedule/Entry list. Moves the selected schedule "up" the list. Moves the selected schedule "down" the list.